To celebrate Valentine’s Day and my birthday, Brandon and I spent a wonderful weekend in a little cottage I rented in the mountains a few hours away. It was such a fun getaway: we did some hiking, we drove around and got lost and we spent a lot of time soaking in the hot tub. When we got back home on Sunday afternoon, I wanted to make myself a birthday cake but after such a relaxing weekend I didn’t want to deal with complicated recipes or put time into making something that didn’t turn out great. That’s why I love the internet and recipe sites with reviews like Epicurious. I mean, if you can find a cake that has 1,400+ mostly raving reviews, that has to be a good cake, right? I am very glad to have found this recipe because those reviewers were right: I now have my ultimate chocolate cake. I honestly can’t imagine another cake being able to surpass it. It’s made with coffee and oil which result in an extremely moist and soft, but dense cake. I’m pretty picky about my chocolate and I found the flavor to be perfect: not too dark or strong but not too sweet, either. I’m sure the coffee helps with the flavor, too. The original recipe had a ganache frosting that didn’t really appeal to me, though; I wanted a fluffy buttercream! 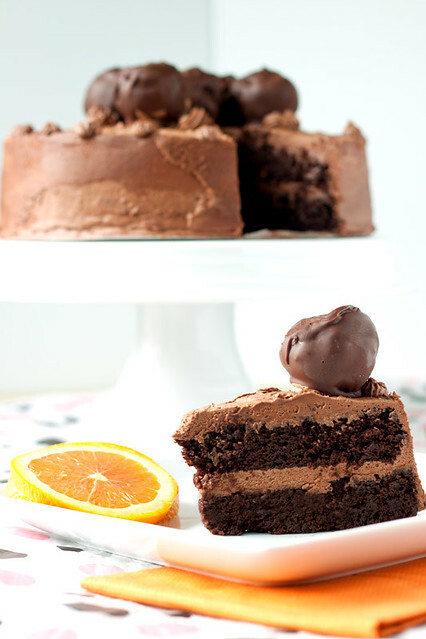 After a little more searching, I found this Chocolate-Orange Buttercream. All the reviews raved about the frosting but not about the cake with it, so it seemed a perfect match for a recipe where everyone was raving about the cake but not the frosting. Brandon seems to think that chocolate and orange is not a good flavor combination, but I love it. And the orange in this frosting is really subtle. The only way I can think to describe it, is that it makes the chocolate taste extra fresh. Like imagine if there was a kind of chocolate that grew on a tree and you could just pluck it off a branch and bite in? This is how that chocolate would taste. It’s still chocolate, but it has an extra zing to it. 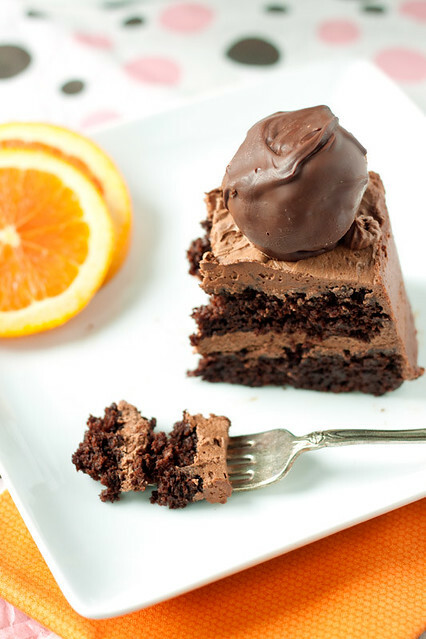 But hey, if you’re like Brandon and chocolate/orange don’t sound like a good combo to you, just leave out the zest and orange extract; you still get a rich, chocolately (it’s made with melted chocolate and cocoa!) frosting. Now you may be wondering about the round things on top? See, I kind of messed up. The cake is supposed to be made in two 10″ pans, but I only had 9″ pans. The cake is so moist and heavy that while it was baking the center started collapsing, so I wound up with some really droopy layers. All I had to do was slice off the excess to make them flat, but that left me with lots of extra cake. It tasted so good that I couldn’t bare to throw any away, so I put it all in a bowl and added in some leftover frosting and made some of those cake balls that I’ve been hearing about for years. I coated them in melted chocolate flavored with a little orange extract. I wasn’t sure what to expect, but they turned out to be really rich and quite good! I put some on top of my cake because, well, why not? I’m not a professional cake decorator and I wasn’t making this for anyone other than myself, so I just had fun with it. I even used my cake decorating tips for the first time. (Obviously, I need more practice, ha!) However it looks, it tastes damn good and that’s all that really matters! 1. For both recipes, use the best quality chocolate and cocoa that you can find. I promise it’s worth the price! I used Scharffen Berger Semisweet chocolate and Ghirardelli cocoa for the cake and Ghirardelli Bittersweet chocolate and cocoa for the frosting. 2. These tutorials for assembling and frosting a layer cake were extremely helpful to me. Preheat oven to 300 degrees (F). Grease two 10″ cake pans. Line bottoms with rounds of wax or parchment paper. (See this great tip for making perfect circles.) Grease paper. Combine hot coffee and the chopped chocolate in a bowl and let stand, stirring occasionally, until chocolate is melted and mixture is smooth. In a large bowl sift together sugar, flour, cocoa powder, baking soda, baking powder, and salt. In a mixer bowl beat eggs until thickened slightly and lemon colored (about 3 minutes with a standing mixer or 5 minutes with a hand-held mixer). Slowly add oil, buttermilk, vanilla, and melted chocolate mixture to eggs, beating until combined well. Add sugar mixture and beat on medium speed until combined. Divide batter between pans. A great way to ensure even layers is to weigh each pan on a kitchen scale and add or subtract batter until they are the same. Bake in middle of oven until a tester inserted in center comes out clean, 1 hour to 1 hour and 10 minutes. Cool layers completely in pans on racks. Run a thin knife around edges of pans and invert layers onto racks. Carefully remove wax paper before frosting. This is a very moist cake, to make it easier to frost, wrap the layers in plastic and place in freezer for 1 to 3 hours. Cake layers can be made 1 day ahead and kept, wrapped well in plastic wrap, at room temperature. Stir 8 oz. chopped chocolate in a double broiler or pan over low heat until smooth. Cool until barely lukewarm but still pourable. While chocolate is cooling, mix cocoa powder and 7-10 tablespoons water in heavy small saucepan. Stir over medium-low heat until smooth and thick but still pourable, adding more water by teaspoonfuls if necessary. Cool. Beat butter, 1/3 cup powdered sugar and orange peel in large bowl to blend. Beat in melted chocolate, vanilla, orange extract and salt until smooth. Gradually add remaining 3 to 3 2/3 cups* powdered sugar and beat until frosting is smooth. *Note: I actually ran out of sugar after about 3 cups and the frosting tasted more than sweet enough to me (and I have a major sweet tooth), so I’m not sure the extra 2/3 cup is absolutely necessary. Place 1 cake layer on platter. Spread frosting over top of cake. Top with second cake layer. Spread more frosting over top and sides of cake, swirling decoratively. Don’t use up all your frosting if you want to make cake balls, you’ll need about 1/2 cup or more depending on how much cake you have leftover. Can be made 1 day ahead. Cover with cake dome and refrigerate. Let cake stand at room temperature 2 hours before serving. Crumble cupcakes and cake trimmings in a large bowl. Add in the leftover frosting, a little at time, stirring until everything comes together. Scoop out a heaping tablespoon at a time and roll into balls. Space evenly on a cookie sheet. Place the cookie sheet into the freezer for 10-15 minutes. Meanwhile, melt the chopped chocolates in a small pan over low heat, stirring until smooth. Remove from heat and stir in orange extract. Cool slightly. 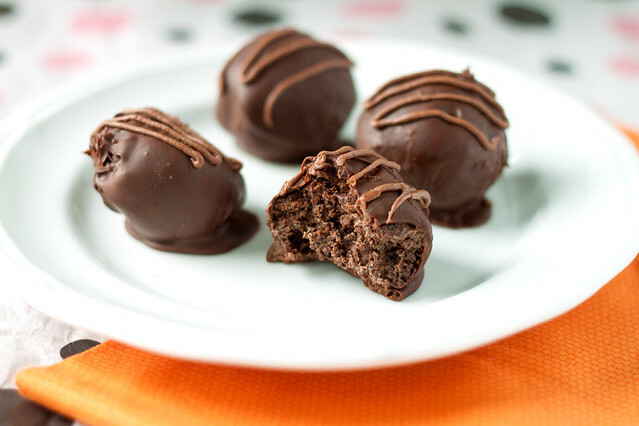 Using a toothpick, dip frozen cake balls into chocolate, making sure to cover well. Tap gently over the pan to remove excess chocolate. Place back on cookie sheet to let harden. Since the balls are frozen it will happen pretty fast. Pipe more frosting on top for decoration, if desired. Note: If you have a lot of cake balls you may want to work in batches, to make sure the cake stays frozen and the chocolate stays melted. Gently reheat the chocolate if it starts getting too hard. I love the cake ball idea, what a perfect garnish! 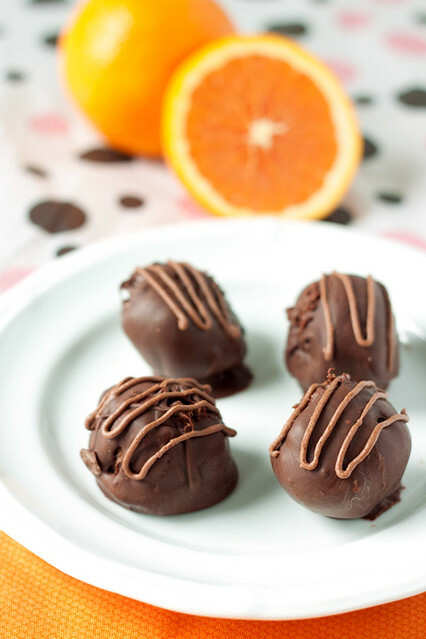 Orange and chocolate totally go together. And they are an awesome pair. The cake looks super moist and rich, just like you said. It’d be worth taking a few bites! Well, a belated birthday hello to you! This cake recipe reminds me of one I make and dearly love. Buttermilk and oil– love it! Coffee really makes the chocolate flavor pop! I think you had a stroke of genius with the chocolate balls– very nicely done. 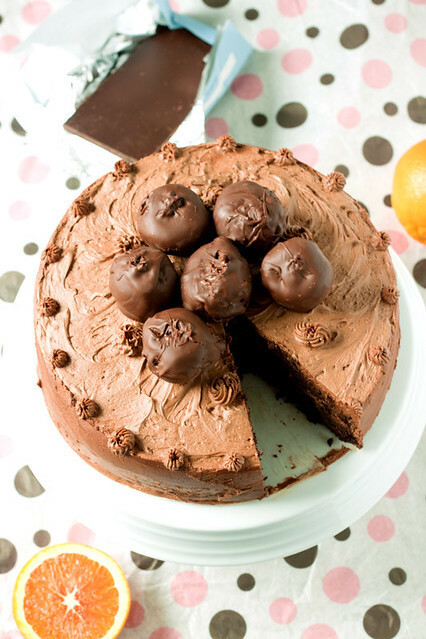 As for orange and chocolate– it’s a great match, and one I don’t think to make very often. Beautiful cake, no matter what you say. Wish you a very happy belated birthday! Everyday should be considered a birthday coz everyday is special – in its own way . also your cake looks good. when i make chocolate cake I frost the layers in buttercream and smoth the top and sides with ganache. Thanks, Pearse! I love your idea of using buttercream in the middle and ganache on top. I think that would work really well with this cake. As for the coffee, yep, I just brewed a regular pot of coffee and used that (my coffee of choice is Dunkin Donuts French Vanilla). I brewed it a bit stronger than usual, but I don’t drink very strong coffee in the first place, so it probably wound up being normal strength. I doubt you could go wrong with making it stronger, though. It seems like that would only help the flavor of the cake. That cake recipe reminds me of Hershey’s black magic cake..which is AMAZING! Look so delicious. I agree. I think it is a pretty good idea and interesting. This cake looks awesome! Sinful! Decadent….I love it. I love trying various chocolate cake recipes, and this one may be next on my list. You’ll find buttermilk right by the regular milk at your grocery store. But if not, you can easily make it home by adding some white vinegar or lemon juice to regular milk (1 tbsp. for every 1 cup of milk). For this particular recipe the easiest way would be to fill a 2 cup (or bigger) measuring cup with 1 1/2 tablespoons of vinegar or lemon juice and then pour milk on top of it until you reach the 1 1/2 cup line. Let sit for 10 minutes so it will curdle and thicken like real buttermilk. I’ve only ever made this cake with 2 layers, so I’m not sure how it would hold up for lots of tiers. It’s a very moist cake, though, so it would probably work best to refrigerate the layers separately for a couple hours or overnight before you assemble/decorate the cake. Deb over at Smitten Kitchen made a 3-tiered cake using a very similar recipe (it uses butter instead of oil) so you may want to use her recipe instead since her tiered cake came out so well.